I have a confession to make: I am addicted to Instagram! No, I don’t love to share my own photos as much as I love to admire the photos of the most stylish and beautiful hijabis all over the globe. One particularly beautiful Instagrammer is Basma Kahie (@basmak) from London. While she may be only 23, she is an amazingly talented hijabi when it comes to styling her outfits. Not only does she sew her own hijabi pieces, she also blogs! She blogs about inspiring the world with her thoughts and ideas on modest fashion and style. You can check out Basma K’s blog here. I love this particular photo above because you can see that Basma K has a few trademarks that work especially well for her. She loved bold lips, cat eyeliner, lashes, and wearing clothes that cinch her beautiful waistline. While these are her trademark staples, I encourage you all to find what works for you. If you look at all fashion icons, they always had some version of what flattered them. For Audrey Hepburn it was straight clean lines, eyeliner for those doe eyes, and her bold brows. For Gwen Stefani, its all about liquid eyeliner and red lips. I am still working on my trademarks, but for now, its lashes, blush, and cardigans. 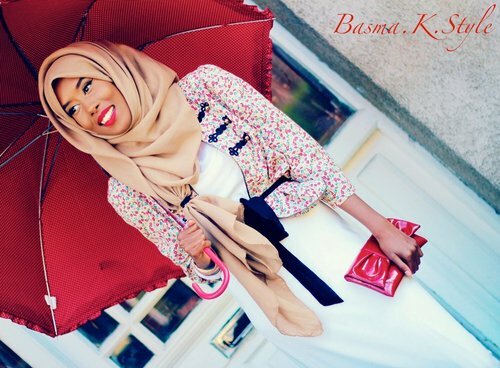 Don’t you love how Basma ties in that darling polka dot umbrella with her cinched blazer? Its perfect for warmer winter days. Make sure to check out Basma K for some inspiration and check out some other hijabi fashionistas on Instagram and let me know who I should follow too! If you are on Instagram, make sure to follow me for my behind the scenes snapshots @hijabilife. That is awesome. I follow her too. Stay tuned for more awesome hijabis to follow on my Follow Friday posts inshallah!